The UVP-3000 mounts on a wall or can sit on any flat surface. Wall mounting brackets included. The UV band of light contains frequencies that penetrate cell walls and destroys the DNA of microorganisms… when this happens they become unable to reproduce and die off. UV leaves no by-products and uses no chemicals. It is a component of sunlight—nature’s way of controlling airborne microorganisms. The UVPhotoMAX utilizes the Ultravation® ReFresh™ advanced oxidation photocatalytic reactor process to improve indoor air quality. It breaks down hundreds of VOC organic odors—from pets, foods, cooking, trash and garbage, paint, carpet, cleaning agents, plus musty damp smells from mold and mildew into harmless components. 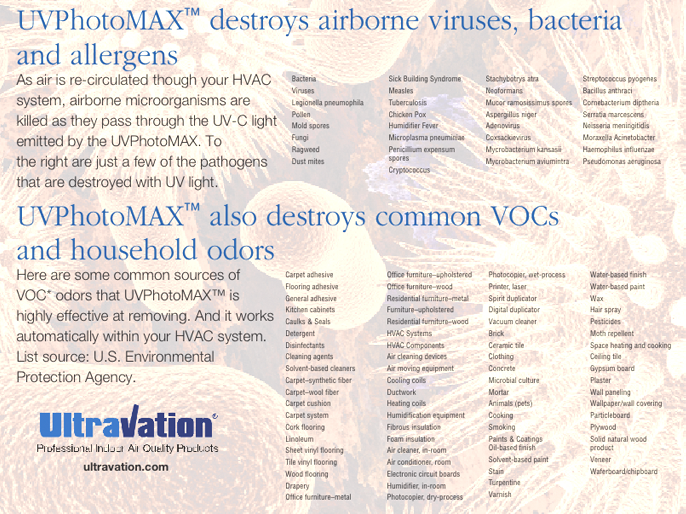 The UVPhotoMAX™ air purifier uses UV light to kill millions of airborne bacteria and viruses (including the flu). UV is a well-known disinfectant, used since the 1930s in hospitals, doctors offices, pharmacy and food industries as well as water treatment. It simply inactivates microscopic organisms, rendering them harmless. It leaves no by-products and uses no chemicals. UV is a component of sunlight—natures way of controlling airborne microorganisms. The advanced oxidation process is powered by our exclusively designed two-band UV lamp and controlled by our patented*** Photon Clarifier™ an Ultravation exclusive! The exact amount of treatment is adjustable based on living space, temperature, humidity, and other factors.. This self-contained germicidal and odor reduction air purification system is compact allowing you to move the UVP-3000 from room to room.